Dina Kowal Creative: Mix-Ability: 9 to 5, and new dies! Mix-Ability: 9 to 5, and new dies! Just a quick post today to share my Mix-Ability card for this week's challenge, and let you know there are NEW DIES over at Impression Obsession! This cupcake stand is one of them. Janelle's challenge to us was to use something found in the office, and showcase it 9-5 times. I used some Post-It note tabs along with my paper scraps for a colorful panel. I cut the cupcake stand and pieces from watercolor paper, and watercolored them with QoR watercolors and Zig Clean Color Real Brush Pens. This card actually fits one of our upcoming Hope You Can Cling To challenges - I'll share more about that event next week! I'm hoping to finish up a sample for each challenge over the weekend, so I can be all ready for the event to start. I hope you'll join us - you'll find a link in my sidebar that will lead you to more info. Have a wonderful weekend, and make art! Trying to catch up with your posts that I've missed and was sure I'd commented on this (how could I forget those cupcakes)? I've been pre-occupied lately (arrival of first grandchild) and may well have typed a comment and not posted it. Anyway, it's a lovely card. 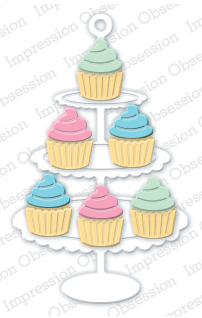 I like the spotty embossing and the way you've made the cupcakes so 3 dimensional.